..... Click the link for more information. mollusk. The squid is one of the most highly developed invertebrates, well adapted to its active, predatory life. The characteristic molluscan shell is reduced to a horny plate shaped like a quill pen and buried under the mantle. The mantle, the chief swimming organ of the animal, is modified into lengthwise fins along the posterior end of the body and projects forward like a collar around the head. As the mantle relaxes and contracts, the squid swims forward, upward, and downward. Water is expelled in jets from the muscular funnel located just below the head, propelling the squid backward in abrupt jetlike motions. Two of the ten sucker-bearing arms (used to steer in swimming) are tentacles that can seize prey, which is then cut into pieces by the animal's strong beaklike jaws. The squid breathes through gills, and may emit a cloud of inky material from its ink sac when in danger. The circulatory and nervous systems are highly developed. The eye of the squid is remarkably similar to that of humans—an example of convergent evolution, as there is no common ancestor. Squids are also distinguished by internal cartilaginous supports. Some deep-sea forms have luminescent organs. The common squid is found from Maine to the Carolinas, often moving in shoals. In the United States tons of squid are used for fish bait, particularly by the cod fisheries in New England. Squid is a favorite food in East Asia and in the Mediterranean area. Species range in size from about 2 in. (5 cm) to the proportions of Mesonychoteuthis hamiltoni, the colossal squid, which is the largest of all invertebrates and may attain a mantle length of 13 ft (4 m) and total length of 33–46 ft (10–14 m), and the giant squid, Architeuthis dux, which has a mantle length of 7.4 ft (2.25 m) and is known to reach 43 ft (13 m) in total length. ..... Click the link for more information. , class Cephalopoda, order Teuthoidea. An acronym for superconducting quantum interference device, which actually refers to two different types of device, the dc SQUID and the rf SQUID. The rf SQUID consists of a single junction interrupting a superconducting loop. In operation, it is coupled to the inductor of an LC-tank circuit excited at its resonant frequency by a radio-frequency (rf) current. The rf voltage across the tank circuit oscillates as a function of the magnetic flux in the loop, again with a period of one flux quantum. Although SQUIDs were for many years operated while immersed in liquid helium, ceramic superconductors with high transition temperatures make possible devices operating in liquid nitrogen at 77 K.
Any of a number of marine cephalopod mollusks characterized by a reduced internal shell, ten tentacles, an ink sac, and chromatophores. The dc SQUID consists of two Josephson tunnel junctions connected in parallel on a superconducting loop (see illustration). 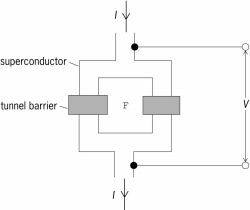 A small applied current flows through the junctions as a supercurrent, without developing a voltage, by means of Cooper pairs of electrons tunneling through the barriers. However, when the applied current exceeds a certain critical value, a voltage is generated. When a magnetic field is applied so that a magnetic flux threads the loop, the critical value oscillates as the magnetic flux is changed, with a period of one flux quantum, weber, where h is Planck's constant and e is the electron charge. The oscillations arise from the interference of the two waves describing the Cooper pairs at the two junctions, in a way that is closely analogous to the interference between two coherent electromagnetic waves.